A must-have for the wardrobe staple, this white blazer by Misha Collection is the perfect finishing touch for upcoming work functions or nights out! 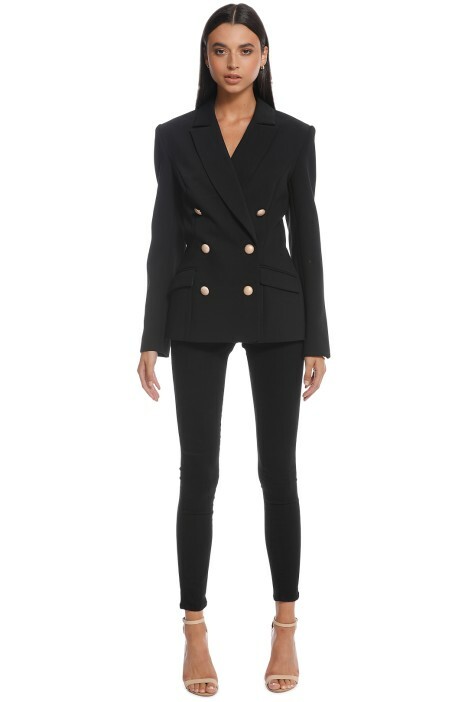 The double-breasted blazer features single lapels and is accented with gold buttons along the bodice and cuffs for extra contrast. Make this yours to rent now! Style blazer with black leather pants and a rose gold crystal pod. Pop on a simple cami available to hire to complete the night out look. Head over to our blog for some celebrity outfit inspiration for girls’ night outs! All products listed are in Australian sizes. Model is wearing size 8. Model is 178cm / 81cm-Bust / 58cm-Waist / 86-Hips.